Bluesdoodles is delighted to have once again the opportunity to have a conversation with the invited participants for the Fifth UKBlues Challenge. The judges are going to have a real challenge in deciding the which of the five bands (Greg Coulson, Tom C Walker, Kyla Brox, Catfish and band number five to be announced after Great British Rhythm and Blues Festival, Jessica Foxley stage will be choosing the fifth band!) are going to be heading off to represent the UK at the 35th International Blues Challenge in Memphis in January 2019 & 9th European Blues Challenge in Ponta Delgada in the Azores in April 2019. GC: Firstly, thanks for inviting me to take part in the challenge. It came as a complete shock, never thought it would be us. We are not really blues, do not play traditional blues. That said we do play to lots of blues fans who seem to enjoy our shows. I am just so pleased to have been asked. Sometimes though it seems like everything is a competition in the Blues scene, people are always asking who is the better act?, who is rubbish?, etc. Blues audiences are often very on it, judging bands. We get told x is good, it keeps happening wherever we play – we like you or this aspect of the show should be changed the blues audiences in general are very critical. The blues scene makes me smile. BD: 2018, sees the fifth UK British Blues Challenge. 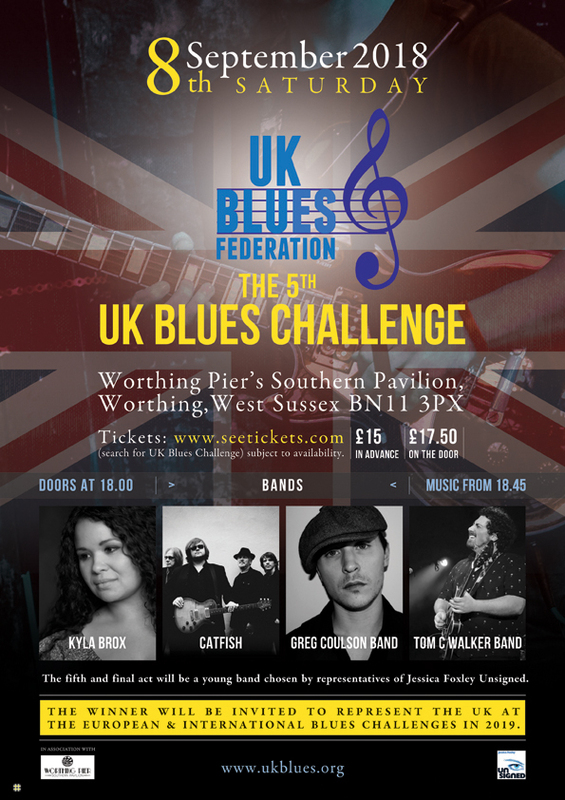 This year the UK Blues Federation are following up the success of the Inaugural Awards and returning to Worthing on the 8th September. Tell us what it means to Greg Coulson to have been nominated to participate in the challenge with the chance of representing the UK in Europe & U.S.A in 2019? GC: It is a privilege, I didn’t expect to be asked and amazed to get this gig. I tend to be a bit pessimistic always a surprise and extra bit thankful and grateful when opportunities arise. Who wouldn’t be excited to have the opportunity to playing in Europe and Memphis? Looking forward to doing the Challenge, it is nice to be recognised. Up and coming blues artists struggle and doing it all yourself it is definitely a labour of love. BD: What are the Blues to Greg Coulson? Do you feel British Blues has a different feel to what is being currently produced in Europe, United States and elsewhere in the world? GC: I have an album that has never officially been released, been selling at gigs, not invested in promoting the album. It is not on Spotify etc. so surprised to be asked when there are other more established bands on the circuit. I am very conscious that we are trying to be a little bit different. A different artist in that sense of not trying to be for example BB King. I am a little white boy out of Northampton. Why play the blues like BB on today’s blues scene? Yes some bands are like that. Whereas Rainbreakers, Catfish, Elles and others, push it that bit more. I like to concentrate on the songwriting keeping it current mood, can’t expect to do same old thing, like Born Under a Bad Sign. I like to mix it up a bit. Rock is definitely being infused into blues by many bands. While Will Wilde with his interesting harp effects makes the sound more contemporary. I do believe the scene suffers from the rise of British Blues in the 1960’s, it is trapped in repeating Red House etc. It has been done before and we need to move on.BD: Tell us a bit about Greg Coulson Band? GC: The band are all good friends of mine, I toured for five years with the bassist when in The Selector, the drummer I have known since I was 17 and then there is Stuart Dixon, to do the solo guitar stuff. He has a distinct sound I have a strong belief it is down to the player not the equipment… I am a keyboard player first, on guitar I am not great it is my second instrument and will never be a Jo Bonamassa or Laurence Jones. Having the two instruments on stage makes it easier to express myself as a musician and songwriter. I believe we put on a decent show and produce a good sound that entertains. BD: Your Album, What’s New has now been officially released. Having been only available at your shows for a while. GC: Well the album is nine tracks, recorded three years ago and produced by Stuart and myself. It was for sale at gigs as a little thank you for people supporting my music. I have been really busy so it worked rather than having a big launch. I was busy with The Selector and after leaving them I had a leading role in West End production of Close to You: Bacharach Reimagined, I even played with Burt Bacharach himself. Before that with The Selector a really different sound, I was the youngest by twenty-five years as joined when I was nineteen. I had a great time playing Ska with them some amazing gigs and toured the world playing the Hammond for them despite not being a Ska fan. After a while I thought I have got to go, so took the risk and got part on the West End out of the blue I didn’t even have a Theatrical Agent. Auditioned and got the part for a year. The past two years I have focused on my own band leading to being part of the challenge. My career has been a mosaic I have tried and persevered on my own stuff. So now the album has had official launch and it is out there for people to hear and hopefully enjoy. BD: What do you feel The UK Blues Federation can bring to the UK Blues what would you like the Federation to be doing for Blues artists on the circuit in Britain today? GC: Maybe take upcoming bands as a resident band at the Blues Awards. Important that they work in raising the profile of all blues musicians. Awards ad challenges are always tricky, the key is the nomination process. Perhaps for the awards deepen/broaden the nomination of who they are so horizons are broadened. There are so many superbly talented musicians that have been for example a guitarist on the scene for years but never get nominated. Perhaps do a challenge tour to make the music inclusive, spreading the word that blues is varied and exciting. Thanks for taking the time to talk to Bluesdoodles, best of luck on the 8th September at the Fifth UKBlues Challenge in Worthing.